Ninety percent of all restaurants fail, and those that succeed happened upon that mysterious X factor, right? Wrong! 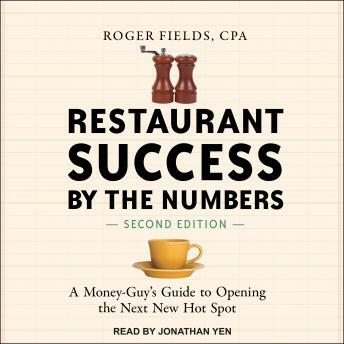 A man of many hats-money-guy, restaurant owner, and restaurant consultant-Roger Fields shows how a restaurant can survive its first year and keep diners coming back for years. Featuring real-life start-up stories (including many of the author's own), this comprehensive how-to walks listeners through the logistics of opening a restaurant: concept, location, menu, ambiance, staff, and, most important, profit. Updated to address current trends such as food trucks and to tackle online opportunities (and pitfalls!) including Groupon, Yelp, and Twitter, Restaurant Success by the Numbers remains a critical resource for navigating the food industry. Opening a restaurant isn't easy, but this realistic dreamer's guide helps set the table for lasting success.